The story of Rome’s Jews is an interesting one. It is commonly believed here that the first Jews arrived as envoys from warrior hero Judah Maccabee. Thus, Jews had lived here even before there was a Republic. These Jews were neither Ashkenazi nor Sephardic, but of a unique variety now called Bené Roma. After the Inquisition forced the relocation of Jews in Spain and Spanish-controlled southern Italy, large Sephardic populations moved to Rome also. Beginning in the 1500s, the Popes—who really controlled Italy—began to issue “papal bulls” restricting the Jews. Most notably, these required the Roman Jews to live in a walled ghetto beginning in 1555. This ghetto was only four city blocks on the edge of the unfortified Tiber, which would periodically flood into the community. Jews were only allowed to sell used clothing or be money lenders, and the gates to the ghetto were locked in at night. The ghetto was finally abolished after the unification of Italy and the dissolution of the Papal states in 1870. However, the little community on the Tiber only grew and thrived once its citizens were fully emancipated. 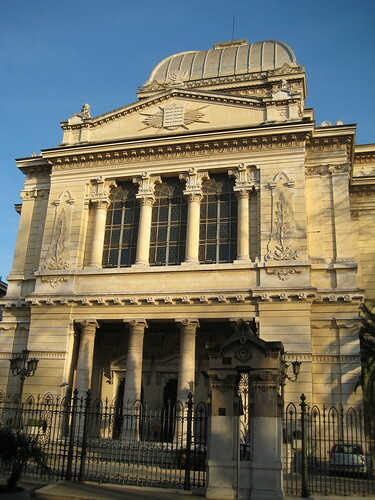 Around 1900, the Jews demolished their five smaller synagogues built something that would be more of a testament to their faith; Tempio Maggiore di Roma. Obviously, the story has continued into the 20th and 21st centuries, with interactions with the Nazis and even the PLO, but I’ve gone on long enough and really just wanted to talk about the building. UPDATE: I don’t live in Rome anymore, and I can’t help you figure out how to attend a service or a seder. Sorry. Really, you wouldn’t believe how many requests I’ve gotten like this. Entry filed under: history, Italy, jews, Roma. Tags: Bené Roma, jewish ghetto, Judah Maccabee, Tempio Maggiore di Roma. You sound like you are enjoying rome. even the Gregorian davenning at the shul. Boker Tov (v’America!) v’erev tov (v’Italia). I wish to offer words of encouragement and advice. Ani Yehudi Italki (I am an Italian Jew). I highly recommend spending extra time within the Communita ebreo di Roma, specialmente Trastevere. Spend some time there. Spend time with the people. You have seen the Great Synagogue there. The thing that links us…you…Uncle Mordecai…and I…in different locations…..is that we are one nation. A nation that knows no geographic boundaries and only One Ruler, Baruch HaShem. For we…the Yehudim Italkim…are almost an “anachronism,” but we are proof that even in a street of confusion there can rest a puddle of truth. “Italkim” is only an adjective. I wish I could serve as a “tour guide,” so to speak. As it is, my prayers go with you. Learn. And the greatest lesson of all? Learn that the adjective only modifies the subject…Klal Yisrael. May the blessings of the Living G-D be with you in all you do. Arrivederla, e a piu tardi. Thanks for the great info on the synagogue. I will be in Rome in April and would like to know where 4 people can attend the first seder. Also, do I book a tour of the synagogue or do I just show up? I would appreicate it if you would reply to my email address. Josh Kramer is a blogger, cartoonist, journalist, etc. I'm the Editor of The Cartoon Picayune. I live in Washington, DC and I just graduated from the Center for Cartoon Studies. See work by me and my classmates.